Note: These opinions are my own and do not represent the opinions of my past, current or future employers. I was requested to have a look at the Mass Cryp ICO as a potential investment opportunity. I had not heard of the coin/token before I started researching so was unbiased going in. This is a brief first impressions review that took about an hour of research. Upon deeper investigation any negative issues noted may be proven false. If you know more let me know and I’ll revise the review. I’ll list the pros and cons that I discovered, again this is my opinion, I do not claim to be an expert in Blockchains, crypto currencies or ICOs but I believe I have enough technical experience and common sense to be able to identify legitimate projects from scams. The idea of the decentralized social media advertising and marketing platform is good. Executed well it could be very successful. This is worrying as it portrays inconsistency and uncertainty. Self FUD if you will. I noted the Mass Cryp team mentioning that there was a separate site for each of the ICO phases. I think it’s just messy and unprofessional. The mass cryp social media channels seem to have very little activity for an ICO that has apparently already sold 13.31 Million tokens. The telegram news channel is read only and was created in late September. There are very few interactions in these groups. 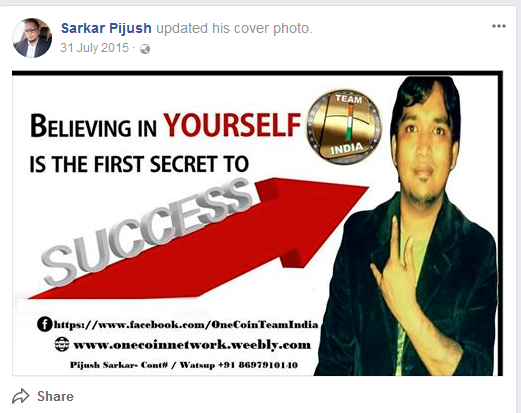 The main person Sarkar Pijush looks to be a self proclaimed blockchain/crypto entreprenuer originating from India. Looking through his Facebook page there is quite a bit of crypto and blockchain activities, and it looks like this may not have been his first rodeo. (pic below) At first impressions, I didn’t get a great feeling of confidence in his credentials and ability to manage and maintain a multi million dollar crypto currency. I did some googling and LinkedIn stalking of some of the other “team” members and although they check out, I am skeptical on their actual level of involvement in the project. I think the majority of them are consultants in some form or another and have possibly just been paid for their services in mass cryp coins from the ICO that they assisted in supporting by putting their names on the website. 5 million for organization’s reserve and 5 million for founders & advisory boards. There is no explanation of what these funds will actually be utilised for and how they will be divvied up to the team members. The whitepaper is sloppy, graphics are not aligned, formatting is poor and it looks quite rushed. The content is fairly well written but mostly consists of buzzwords and hype. There is a brief mention of the coin distribution in terms of ICO and POW mining though there are inconsistencies (100 billion difference) between the whitepaper and one of the websites. There is no mention that I could find of the actual development process and technology that will be used to build the application. No links to github repositories or even any reference to an internal development process. There is also no mention of what crypto currency the coin/token is forked from, but I have a feeling it is an Ethereum token that can be created in a few minutes. There is no detailed information on what “MASSCONNECTS” actually is or how it works, it’s the ultimate buzz word. Each of the websites has a different set of buzzword hype to describe what the platform and currency are actually going to be used for. There is no consistency. None of it makes any sense at all. 3. “Masscryp is the first decentralized platform in the digital advertising world based on blockchain technology, backed up mass cryp cryptocurrency that uses sha-256 cryptographic hash algorithms (pow).” — WTF?? Personally, I would not be investing any money into this “ICO”. If it is a legitimate project then it is extremely poorly executed. My gut feeling is that it is a fraudulent ICO and company that will disappear within 12 months after selling off all of the pre-allocated ICO tokens for an amazing profit to the “team”. Again, this is only my personal opinion, I have provided my first impression thoughts. If you have solid evidence to the contrary I am more than happy to see it and will promptly revise this review.